We’ve been hard at work recently creating a new linked open data site for the UK Department for Communities and Local Government (DCLG). This is a major overhaul and extension of the OpenDataCommunities site that we first set up last year, with a new design, lots more data and new features aimed at making access to the data easier. 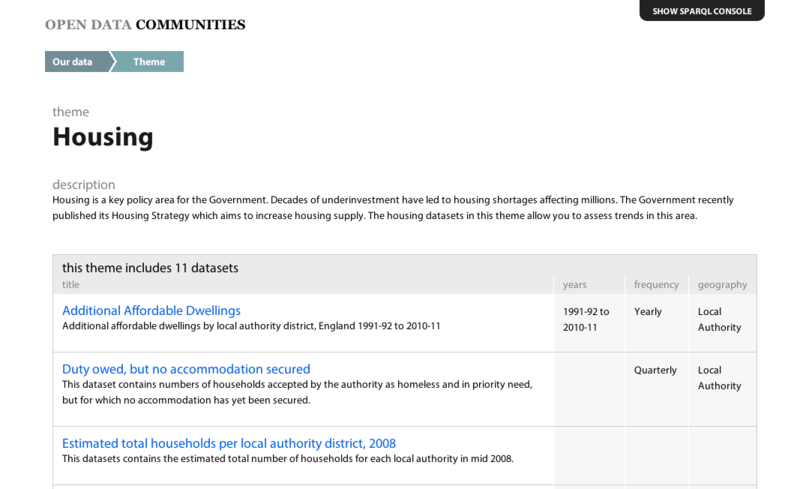 A selection of datasets from the DCLG on housing, deprivation and finance statistics for local authorities have been converted to RDF and presented as Linked Data, using our PublishMyData linked data publishing platform. The main part of the site is aimed at developers and those who want access to the raw data. You can explore the datasets that are available and access the data in machine readable formats. All data is available through the Linked Data and SPARQL APIs. This approach makes it possible to pull out the data needed to build applications and visualisations, or to integrate the data with other systems. We’ve been working on some illustrations of this and will be writing about those in the next few weeks. This is a pilot study for DCLG: designed to explore what is involved in making their statistical datasets available as linked open data and to understand what benefits this can offer. So both we and the DCLG are very interested to hear feedback about the site and how the data it holds might be useful to you. Get in touch with us at hello@opendatacommunities.org or on twitter, @odcommunities. If you want to use the data, but you’re not sure where to start, then we’d be glad to help: give us a shout.